So far I've just heard a preview - but I'll be out to buy it upon release. 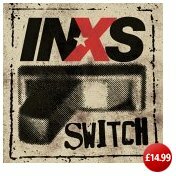 This is INXS's first studio album since the death of Michael Hutchence 8 years ago, and was made in just a month once their new singer, JD Fortune, had been recruited through a reality TV show. Don't let that put you off - all of the competitors were gigging musicians with fantastic voices, and JD was a very worthy winner - edgy and charismatic. One of his songs, "Pretty Vegas", is on this album. When you hear the opening track, "Devil's Party", it's hard to realise it's not Hutch singing. JD's sultry voice definitely emulates him, but I'm not sure it's deliberate. The melody of Devil's Party is similar to "Original Sin" and so with familiar voice and tune, it's easy for an INXS fan to drop into the album and be hooked from the off. In fact, it's almost like Hutch never left - I suspect the real test won't come until their live shows. Generally, this is a fast paced album in INXS's familiar style, upbeat rock that you can dance to, with soulful and bluesy edges here and there. There are a few ballads such as "Afterglow", which is where JD's voice seems more distinctive, and on the final track, "God's Top Ten", he is joined by Suzie McNeal (the last woman to be eliminated on Rock Star INXS). As ever, the songs are skillfully written so there are no cheesy moments, just good solid songs. Even the playful "Hot girls" is pulled off with style. Kirk's distinctive sax playing is back too, most notably in "Perfect Strangers". This is a fun, punchy and sometimes reflective and beautiful album. It shows that their reality show wasn't just a gimmick; INXS are definitely back on top form with a new singer to take them forward for many more years to come.